Are You "Under-Cheesing" Your Customers? Openly admitting a flaw in your own product. The commercial shows two Domino's chefs in the kitchen discussing cheese bread. They tell the audience that they've been studying the competitors' cheese bread and have discovered that most companies are guilty of "under-cheesing". Surprisingly, they admit that Domino's was one of the worst offenders. Most companies don't have the guts to admit a flaw in their product. Instead, they often make excuses. However, when you admit a flaw—and then offer a solution—you earn the audience's trust. And we all know that trust is the foundation for not only making sales, but more importantly, establishing relationships with your customers. It's similar to a trial lawyer. When a lawyer brings out a weakness in his case, before his opponent has a chance to point out the flaw, it "takes the sting out". It minimizes the impact and gives him a chance to proactively overcome that weakness. The jury recognizes the honesty, either consciously or subconsciously, and will be more forgiving. And they will listen more intently as he explains his way out of it. Obviously, this is much more effective than responding defensively to a competitor's claims. Domino's handles this in a humorous way... they admit to being guilty of "under-cheesing". 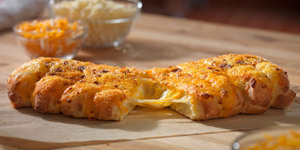 So to solve the problem, Domino's introduces "Stuffed Cheesy Bread." More cheese baked right into the bread. How can your company strengthen the trust of your customers by admitting a weakness? Is there a common weakness in your industry that you could point out—then overcome—while suggesting that your competition still under-performs in that area? Are you "under-cheesing" your customers? Do they feel cheated when they receive your product/service? Or do you make them feel they've received more value than they paid for? Admitting your flaws, offering solutions and giving more value than you expect in return. These are the keys to earning trust. And trust leads to loyal customers who reward you with repeat business, testimonials, and referrals.